A picture-book allegory about life and, to some extent, love. It is undeniably adorable, with a winsome protagonist, sweet animals, and great but not aggressive production (lovely paper and a light-catching glaze). Less a meditation on metafictional existence than a stand-in story for an existential quest (why am I here? ), the tale of this “boy” is actually fairly low-key: “One quiet morning, a small boy landed on the page.” Though a little nonplussed, the boy quickly finds himself exploring the limits of his world. 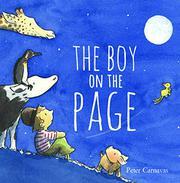 His animal companions—a friendly pig and a small yellow bird—stick with him as he experiences art, music and adventure. Later, he grows a beard, still looking endearingly like his young self despite facial hair, and becomes a partner and a father. Near the book’s end—the pages’ end—the elusive, universal “why” has him leaping into the unknown—whether disconcertingly or boldly will depend on individual readers or listeners: “Looking for answers, he tried something he had never tried before. / Jumping off the page… // …waiting for him there was every…person he had ever loved.” The boy, now clearly a grown and elderly man, is both enlightened and reassured. Will the young readers and listeners feel the same way?